Every year I try to make a gift for all of the ladies who work in the church Nursery. Just a little something to say thanks, and to hopefully encourage more ladies to volunteer. 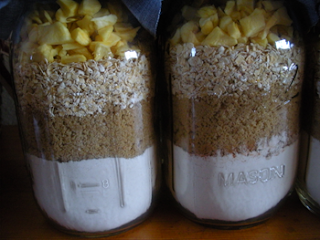 I found this recipe for Apple Cinnamon Muffin Mix a few months back and emailed Nana to see if she was up to helping me. 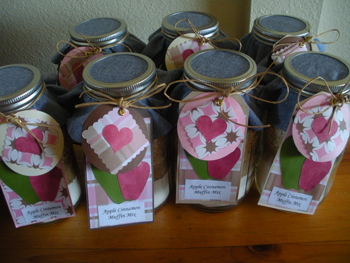 We split the costs of the jars and ingredients, made the tags with our own scrapbook supplies, and just used fabric and twine that we already had. Each jar has two tags. One completes the recipe and the other is a little thank you note. 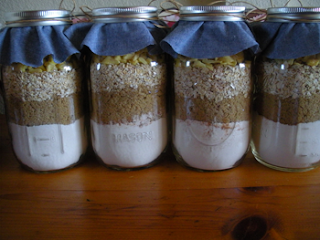 I am in love with these jars. I wish they weren't so heavy so I could ship them as gifts to other women I love. We skipped the nuts in the recipe to avoid allergies but the jars were pretty full so I'm not sure if they would have fit anyways.